During the 1840s, famine and subsequent political unrest in Europe precipitated massive immigration to the United States. Middle Village attracted immigrants with flat fertile land and the expanding industrial boom in nearby Newtown and Maspeth. In 1850, the community assumed its present name, possessing sufficient population to distinguish itself from Maspeth. By 1902, the population had only reached 1,300 people with functional farms operating through the First World War. During the 1920s, however, a demand for housing spurred development; rows of single-family homes near Metropolitan Avenue and Juniper Valley Park were built to accommodate demand. Following World War II, Middle Village became the home of many Jewish and Italian residents. During the 1990s, immigrants from the Balkans added further diversity to Middle Village. Metropolitan Avenue remains a center of commerce, catering to cemetery visitors. 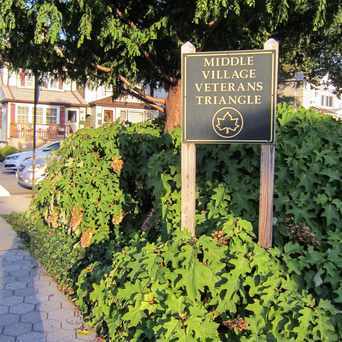 Middle Village Veterans Triangle underwent renovations in December 1999, thanks to $15,000 in funding from Mayor Giuliani. The park is planted with shrubs, ferns, and ivy. In the center is a London plane tree (Platanus acerifolia). The perimeter is paved with hexagonal tiles. The triangle is now part of the Greenstreets program, a joint project of Parks and Transportation begun in 1986 and revived in 1994. Its goal is to convert paved street properties, such as triangles and malls, into green spaces. In the park is a large granite monument, erected by the citizens of Middle Village and the Property Owners’ Association of Middle Village Inc. It was originally erected to honor the men of Middle Village Post 784, who fought in World War I, and now honors all wartime servicemen.